Fat injection is a procedure whereby fat is removed by non-invasive liposuction of the belly or thighs/flanks and injected into flat or hollow parts of the face. Isolated areas such as the cheeks can be injected alone. Some people, especially thin people and athletes, desire full facial augmentation. It is effective for filling deep facial lines, sunken cheeks, sunken eyes, descended brows, nasolabial folds, deflated lips, and the hollow crease in front of the jowls. 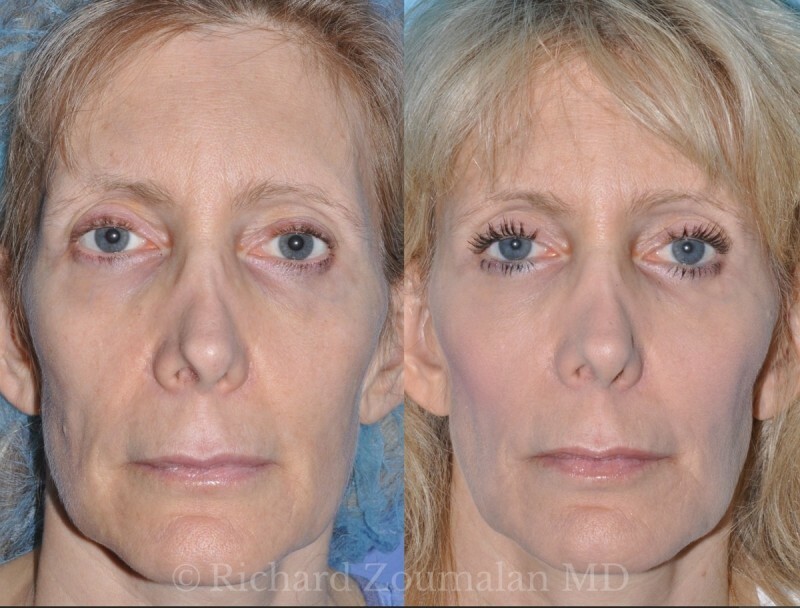 This very active woman underwent fat transfer by Dr. Richard Zoumalan. Over the years, she had lost much facial volume. She had tried Hyaluronic acid fillers like Juvederm and Restylane. She had also tried Sculptra. However, she wasn’t satisfied with the neither effect nor length of effect of any of the fillers she had undergone. She underwent only fat transfer by Dr. Zoumalan under local anesthesia with sedation. She did not have general anesthesia. No other procedures were performed. Fat was obtained from her hips and thighs. She was also happy about the contour of her hips and thighs after the procedure. Fat transfer is an excellent procedure for you if you want long-term facial enhancement without the need for repeat injections of fillers such as Juvederm, Restylane, Perlane, etc. 1. Softer, smooth, and completely natural results. 3. For people that require larger volumes, it is more cost-effective over the years. While the cost of fat transfer may be larger than a one-time treatment of injectable fillers, the cost of repeat injection of fillers can add up and be more than the cost of one fat transfer that will last longer. 4. Non-surgical procedure to reshape the face. The procedure can be done under local anesthesia with a very small level of sedation. Dr. Zoumalan involves an element of artistry for the injections to enhance your face, similar to touching up a beautiful painting. There is little to no downtime. You may have some swelling, but the procedure itself has minimal discomfort, if any. Dr. Zoumalan performs fat injections by using a new micro-droplet technique. Micro-droplets are very small amounts of fat that are injected in a way to give a smooth feel and look. In addition to a more smooth and natural appearance, the micro-droplet technique allows for more of the fat to stay alive and healthy. This is a recent development which decreases the likelihood of any lumpiness. Fat may also contain stem cells that improve the overall health of the facial tissues. Stem cells are undifferentiated cells that can become any one of a number of cells. They can help repair parts of aging tissues other than fat. Many patients who have undergone the procedure say that the appearance of their skin has improved as well. Current medical studies aim to validate that the cause of this is the stem cells’ transferred fat. 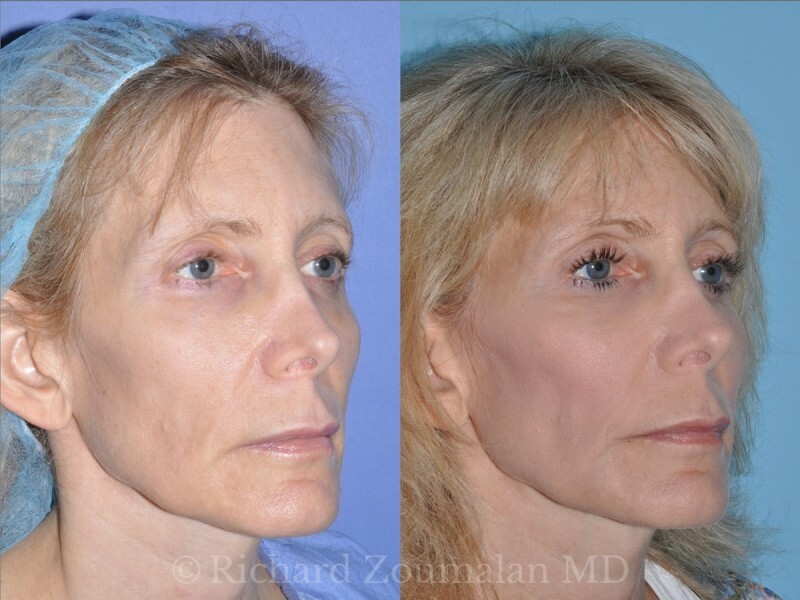 Dr. Zoumalan often performs fat transfer at the same time as a Facelift. The reason for this is because a Facelift does not improve hollowed areas of the face. These need to be augmented (filled) with volume. Since the patient is already in the operating room, this is a great opportunity to improve facial contour by injecting fat in a tasteful artistic way. Can it be done in the office? Yes, fat transfer can be performed in the office with local anesthesia and sedation. It is a simple, safe procedure which takes 1 to 3 hours, depending on how many parts of the face are being treated. Does the Liposuction in Fat Transfer Improve my body shape? This really depends on how much fat is being removed and from where. If you would like more fat to be removed than what is used for fat transfer, more extensive liposuction can be performed. Most patients who undergo fat transfer see a tasteful reduction in fat from the areas that are used.